Located on Hokkaido, the northernmost island in Japan, Hokadate sits under the vast 334m-high Mount Hakodate. Hop on a tram that can take you from one end of the city to the other in just 45-minutes or enjoy a leisurely stroll through the area that takes you past historical buildings. Looking for a break and some soothing relaxation? The Yunokawa Onsen is a spa resort area offering up many hot spring hotel and inn options. How about enjoying the company of wildlife while you relax? How about some snow monkeys? Within the Yunokawa Onsen area you’ll find the Hakodate City Tropical Botanical Garden where about 100 free-range Japanese macaques (a.k.a. snow monkeys) have been known to warm up in the luxurious mineral water. Meanwhile, it’s easy to bring a little piece of Hakodate home thanks to the ample souvenir shopping locations. Then, once you’ve had your fill of the urban experience, a quick express train will take you to the suburbs of Onuma, a beautiful resort area full of mountains, lakes and forests, where you can soak up natural beauty. Taking in the glorious night view, seeing the city lit-up, is a only short cable car ride away from the city center. It takes just three minutes to ride up to the summit station where you can take in the beautiful vista, pick up souvenirs and visit restaurants. Rest, relaxation and restoration are what you’re after with a visit to this area situated next to the ocean. A number of retreats provide guests with lovely views of the ocean, while there are a variety of hotels and inns to choose from, offering different bathing experiences along with delicious dining options. Immerse yourself in what Hakodate has to offer with a trip to the Morning Market. There you’ll find about 250 stores stocked with souvenirs, especially seafood delicacies. Get your day started on the right foot with a fresh bowl of rice topped with just-caught seafood or try your hand at squid-fishing onsite. Join your Azamara Chef on a culinary journey that shops a local market, samples Japanese beer, and culminates with a private shipboard dinner. Enjoy a fun-filled and enlightening afternoon at an all-girls high school in Hakodate, where students will lead a traditional tea ceremony and calligraphy lesson. 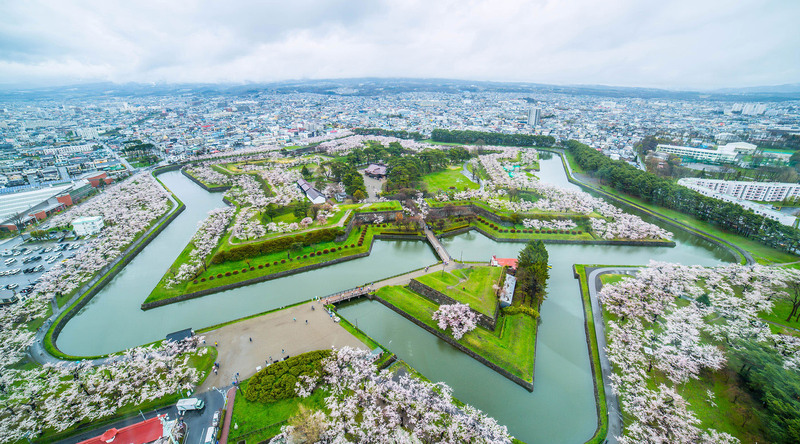 Discover the treasures of Hakodate and take the cable car to the summit of Mt. Hakodate for spectacular views of the city and harbor.